So, what is your equipment? Essentially, your entire body is a tool through which you receive and transmit information. Your entire body is in constant relationship with the Universe—downloading information from the quantum field and uploading information into the quantum field. There are three major players in this universal dance of life: Your DNA, your brain, and your heart. First, let’s talk about DNA. The DNA receives every pulse from the Universe and transmits back into the Universe our unique frequency—messages about who we are and what we want. Our DNA represents our entire genetic blueprint. Dr. Fritz-Alpert Popp proved that light emissions are emanating from our DNA, the core reactor from which we are broadcasting our personal energy signature. Dr. Bruce Lipton’s work is proving that we can actually reprogram our DNA. What he has discovered is that the nucleus of a cell is not read only. It is actually read and write. Basically, the cell is a programmable device, in response to environmental information. Therefore, if you are dissatisfied with your blueprint, you can change it and broadcast a new message about yourself to the universe. Scientists have recently shown that emotion affects DNA. A group of researchers in the UK were studying depression and noticed unexpected metabolic changes in their cells that appeared to be a result of the depression. And if a low-frequency emotion like depression has such an impact, imagine what impact a high-frequency emotion like love or gratitude must have. Researchers at the HeartMath Institute experimented with this by placing DNA in vials and then generating certain emotions as they held the vials. What they found was that the DNA altered its shape in response to different feelings! Love, gratitude, and appreciation caused the DNA to relax and the strands to unwind, while anger, frustration, and stress caused it to tighten up and even switch o many of its codes! When the positive feelings came back, these effects were reversed. In each one of our cells, there are 46 human chromosomes (23 pairs), which contain as many as 3 billion base pairs of DNA. Each of these billions of strands inside of us stores our personal information. If we can reorganize our beliefs, thoughts, feelings, and the vibrations we are transmitting at a cellular level, we can reprogram our own personal blueprint to attain any goal we desire. Next, let’s talk about the amazing lump of grey matter inside your skull: your brain. While there is much we still do not understand about this complex organ, recent advances in neuroscience have begun to reveal more and more about its workings. However, one thing science has yet to convincingly explain is where the miracle of human consciousness comes from. Some staunchly take the view that it must be produced by the ring of neurons within the brain; others are open to explanations that do not reduce consciousness to a material process. I will not attempt to weigh up all these complex arguments here, but my views fall into that second category. Many scientists today take similar views, comparing the brain to a radio that can be tuned to different frequencies in the spectrum of consciousness. And if the brain is a receiver, it is also a transmitter, carrying the vibrations of your thoughts and feelings out into the world. So here you are, a human being who carries around this powerful instrument for receiving and transmitting vibrations of energy. And those vibrations of energy co-create the reality you live in, rearranging the atoms of your world in response to the frequency you’re sending out. Pretty incredible, right? But if you’re going to harness this power in service of your heart’s desires, you need to learn how to tune the dials of that receiver/transmitter. If you’re tuned in to a limited, mediocre, depressing channel, you’ll co-create a limited, mediocre, depressing life. The tool works, but the results are up to you. The Universe doesn’t judge—it has given you the power to do that. Most of us don’t even know that there are other channels out there that we can tune in to. I sure didn’t when I was a young man. I had my radio dial permanently set to a channel that told me that the world was scary and untrustworthy, and that life was basically out to get me. Most people’s mental and emotional radios are tuned to channels whose programming and content have been brought about by their past. Maybe the voices of their parents are speaking constantly on their private airwaves, telling them what they should do, what’s possible, what life is really about. Others hear the voice of a childhood religious authority, or the chatter of their own self-doubt. If your car radio was always tuned to one channel and that channel played the same limited content day in, day out—the same boring local news, the same repetitive dull music—it would drive you crazy! Imagine how happy you’d be to discover that you simply had to turn the dial to receive access to different kinds of music, news, and information about places you’d never been to, ideas to stimulate your imagination and inspire you. Well, the same is true for your brain. There are other channels in the Universe. And even more importantly, you have control of the dial! Of course, it’s not as simple as just turning the dial once. Being tuned in to your limited channel has become a powerful habit, and every time you “start your car,” your radio may default back to that frequency. It will take repeated tuning and retuning before you begin to develop a new habit, which is why you need to have patience and persistence. Finally, let’s talk about your third receiver and transmitter—your heart. Did you know that your heart is in fact an electrical organ? It is by far the strongest source of bioelectricity in our body, up to 60 times stronger than the brain, which is the second most powerful source. Scientists have found that the heart produces an electromagnetic field that surrounds the entire body. The heart is the most powerful broadcaster. Of all the energy senses of the body, the heart center produces the strongest signal. If we are disconnected from our heart because of fear or false beliefs, this central power source is damaged. When we transmit to the Universe we are sending out a weak signal. Do the laws of attraction hear a weak signal? e heart broadcasts your intentions into the Universe so that the very fabric of the Universe morphs to accommodate these intentions. Emotion is the power for the broadcast. e more powerful emotions are attached to the intention, the more powerful the energy that the heart transmits. Once you attune to a higher-frequency state, the heart acts like your truth meter. Run every thought through the heart. The heart knows. The thoughts of the mind can trick us. e mind can pick up unhealthy subconscious thoughts, which are really memories or past programs playing. The heart speaks in feelings, which can be more pure. Trust the heart, it has its own intelligence. The heart must work together with the brain to manifest the vibrational conditions necessary to co-create the life of your desires. If you can create a coherent vibration between your DNA, mind, and heart you will have access to unimaginable power. 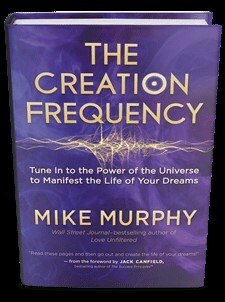 When you tap into this frequency, you will find yourself able to work in partnership with the Universe to manifest the life of your dreams.